Early on in the the nomination of D.C. 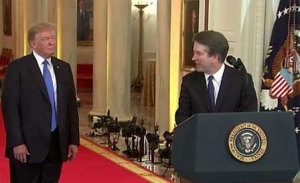 Circuit Court Judge Brett Kavanaugh to fill the current vacancy on the Supreme Court, political researchers exploring Kavanaugh’s likely ideological ranking on the political spectrum placed him right next to Justice Clarence Thomas, suggesting affinity between the two when it comes to how they would act on the court. The current sexual assault accusations against Kavanaugh invites a second comparison about what they might have in common even off the court–namely, their denigration of women–and the Republicans’ consistent willingness to overlook it. There are obvious parallels between the way current GOP leaders and the President are treating the current accuser, Dr. Christine Blasey Ford, and Anita Hill, who emerged in 1991 with sexual harassment claims during the Thomas confirmation process. Decades after Anita Hill made the words “sexual harassment” common language and just a year after the #MeToo movement brought down titans in the business, political and entertainment sector, Republicans are still jeering and dismissing sexual assault and misogyny instead of stopping it. President Trump–as though tweeting from a time warp–is predictably blaming the survivor and dismissing Ford’s trauma since she didn’t broadcast it the day it happened. Kavanaugh’s second accuser, Deborah Ramirez, may even be denied the opportunity to testify before Senators. The Republicans’ response to these devastating accusations against their nominee is part of an overall pattern to turn the back the clock for women. The implications for our nation’s future are dire, particularly for poor women and women of color who will face the greatest consequences if we end up with another Clarence Thomas on the Supreme Court. Activists worried about the fate of Roe v. Wade have mailed thousands of coat hangers to Senator Susan Collins, a critical deciding vote on the Kavanaugh nomination, signaling their concerns about rewinding the era of back alley abortions. North Carolina women share these concerns but, frankly, we’re more worried about hand-cuffs than coat-hangers these days, since access is a bigger issue than safety for most women. Today, nearly half of all abortions today are conducted with FDA-approved medications, not surgery. Studies show that medication abortion is incredibly safe resulting in complications in fewer than .4% of cases. In some states, over half the abortion are already conducted using pills at home, not on a table in a clinic. That means women today are more likely to reach for a pill bottle than a coat hanger. In a post-Roe world, they could be arrested when they do. Without abortion rights, terminating a pregnancy even with a very safe method like medial abortion could become a criminal act subject to legal punishment like incarceration. Women of color will face the greatest consequences since they already have the least access to contraception and affordable health care and highest rates of unintended pregnancy, especially in the South where few states including North Carolina, have implemented the Medicaid expansion to provide health coverage that women need to access birth control and other services. Women are the fastest growing population behind bars, particularly women of color who are most likely to lack the resources to avoid incarceration or to pay the fines and fees to get out of jail once they are locked up. Over 80% of the women in prison have children. While we tend to think of Roe v. Wade as protecting women’s rights to not have children, in fact the law also more generally provides legal protections to pregnant and parenting women who are facing increased criminalization for all kinds of behaviors from addiction during pregnancy to miscarriage or stillborn births. Recent high profile cases of Purvi Patel, an Indiana woman imprisoned for a stillborn birth and the Pennsylvania Kasey Dischman prosecution for a premature delivery while addicted to opioids, are examples of a growing trend that strips women of their civil rights if they are deemed to endanger unborn fetuses. That trend could accelerate without Roe protections especially in the context of the anti-women agenda we see from politicians currently in power. The President has said women should be punished for having abortions. Congress keeps trying to reinstate gender discrimination in health insurance by repealing the Affordable Care Act. Kavanaugh–on top of calling birth control “abortion-inducing drugs” thinks employers’ religious beliefs is a good reason make women pay more for the birth control that prevents pregnancy at the same time he suggests that Roe v. Wade is an overreach. It’s not at all far-fetched to think we could soon be seeing more and more women in jail for exercising basic rights we’ve had for decades given this pattern. That’s why the Senate must reject Kavanaugh for the Supreme Court vacancy. One Clarence Thomas on the court is already too much. Naomi Randolph is a gender and racial justice activist, a native North Carolinian, and a Senior Advisor at Action NC.